There are a few other things we can do to get control and to feel happy, relaxed and productive, naturally. Because of the way we've evolved, we get certain positive rewards in our bodies and minds for doing things which help us to survive. We've always had to hunt and gather, and look after each other in various ways, so we've evolved so that when we do, we get a positive reward. This helps us feel pleased, motivated to do more, and even to feel brave in the face of danger, and strong in the face of pain. These days we call these rewards neurotransmitters, and they are really important because not only do they help our brains to work faster and better, and help us to feel good, they help us to cope - with whatever life throws at us. When we get the right flow of serotonin, dopamine, endorphins and noradrenaline - we become courageous, strong, capable, inventive, resourceful and whole bunch of other things. We become the best version of ourselves. Three particular things help to achieve this. Positive activity, positive interaction, and positive thinking. When we engage in these three things we get a nice steady flow of all the right chemicals and life is good. ​A few things can interrupt this flow. If we spend too long down the miserable end of the spectrum, dwelling on things we don't like, we can start to withdraw, shut down, lose energy - and we don't produce any chemicals at all. 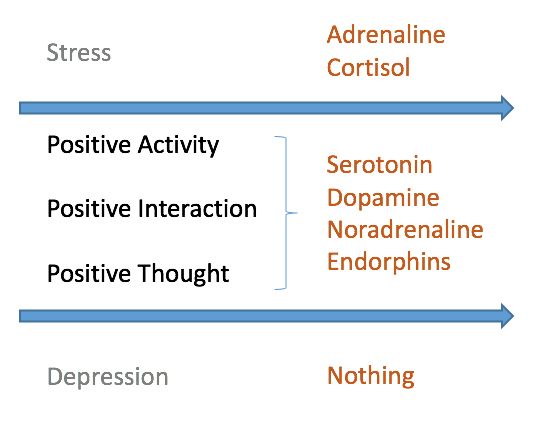 Up the anxious end of the spectrum - we get too much of the wrong chemicals - adrenaline and cortisol. Good for escaping from bears, and short term problems. Really not good over a longer term. So the middle zone is where we want to spend most time. And a sure sign that we're achieving that is when we find ourselves enjoying things. In this context, doing what you enjoy is not just a nice-to-have. It's essential. Well done - you've completed the first section of USE: Understanding the Brain. Now it's time to complete some questions to help you See the Future.